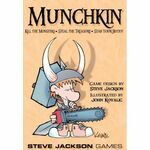 Expansion for Muchkin Cthulhu and Munchkin Zombies. Includes a double sided game board, 24 tokens (with special bonuses!) and 8 new cards (4 for each game).